I went to a party a couple of weeks ago, and my friend asked me to come to his kitchen and help him. 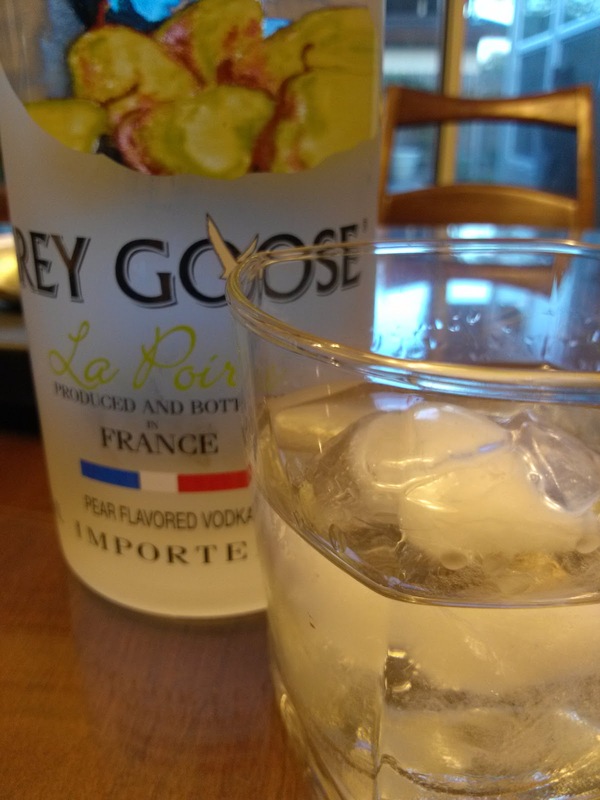 Seems that someone else who was helping with the party had given him a case of Grey Goose La Poire Vodka to serve at the party, and my friend didn't know what to do with it. He made a punch with St. Germain, La Poire, and lemon, but it didn't taste right. So we made a simple syrup, added more lemon, and got a tolerable punch together. Everyone loved it, in fact. To thank me for his trouble, he gave me a bottle of the stuff to take home. Heck he had three more bottles left. So I finally got around to opening it this weekend, and decided to see how it worked in a few different drinks. First, we tried a Cosmopolitan with it, and the Cosmo was excellent. The pear added a distinctive fruit smell different from the common citrus vodka. It was delicious. Last night, we made Cape Cods. They were good, too. Man, this stuff was turning out to be great in traditional vodka cocktails. It adds a new note that changes the flavor of everything you put it in. Basically, it adds a smell. 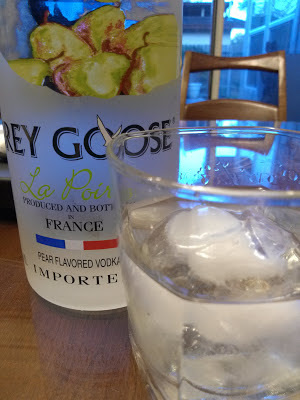 It's still vodka--flavorless and odorless--and the La Poire Vodka adds a little of both, especially the odor part. So tonight, I went for it on the rocks. The first sip burned and tasted like medicine. After a long day of work, a straight glass of vodka was not what I needed. But after that first sip, it mellowed, I mellowed, and I began to taste the vodka. At first, it smells like pears. Striking, I know, but it's true. And then it begins to smell like dried bananas. Even the taste is like a cross between pears and dried bananas with a little bit of bread thrown in. It doesn't have the medicinal taste that I expect from flavored vodkas, so I recommend it as an addition to regular vodka cocktails. Even straight, it's not bad.